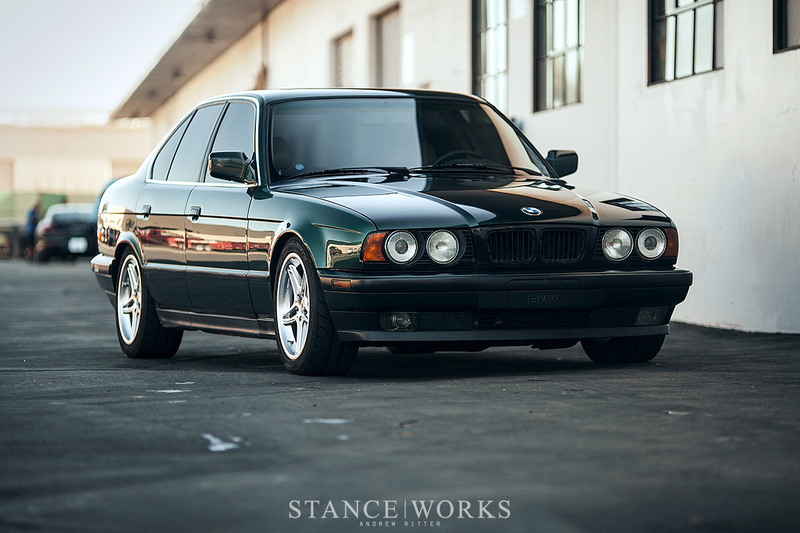 Ever since moving to California, Josh Dahlstrom has been jonesing for an E34. He's had a few in the past, and following a 2 year bout with a C5 Vette, he's been ready to return to his roots. He recently lucked out, finding a well-maintained 535i 5-speed in need of a new home. With Island Green Metallic paint, a manual transmission, and an enormous binder of ownership records, it ticked a lot of boxes. Within a few weeks, wheels and tires were on order, and now, the car sits rather well on a set of period-correct Racing Dynamic wheels and Nitto NT05 tires. As good as it looked, though, we all agreed there was room for improvement. With that in mind, we figured there are few better opportunities to teach our readers about wheel spacers. 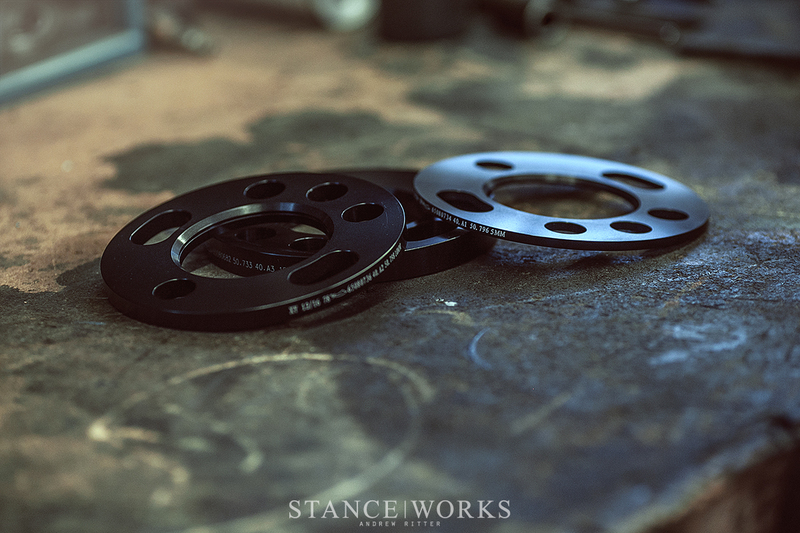 Yes, they are quite simple, and we're sure many readers may balk at the idea of a how-to, but here at StanceWorks, we aim to teach all, and that includes the newcomers, or even just the guys and gals that want to know a little bit more about what goes into selecting the right spacer for their car, and why they might want them. The purpose of wheel spacers is simple: they push the wheel outwards, away from the car and suspension components. Simple as that. There are a handful of reasons and benefits, so we will touch upon the most prominent ones: wheel and tire fitment, component clearance, and increased track width. 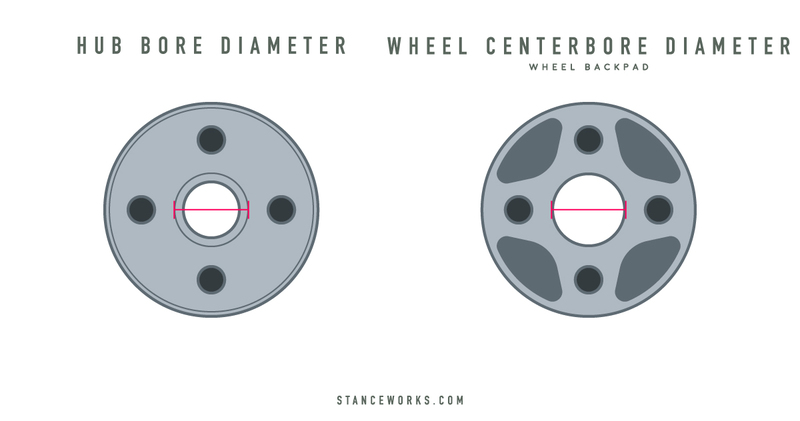 For wheel and tire fitment, the explanation is simple. A car's presence and stance are rarely better than when the wheel wells are filled nicely with a good wheel and tire package. When buying wheels, we're not always afforded the budget or opportunity to order or build custom wheels, meaning we're destined to work with what we've got. 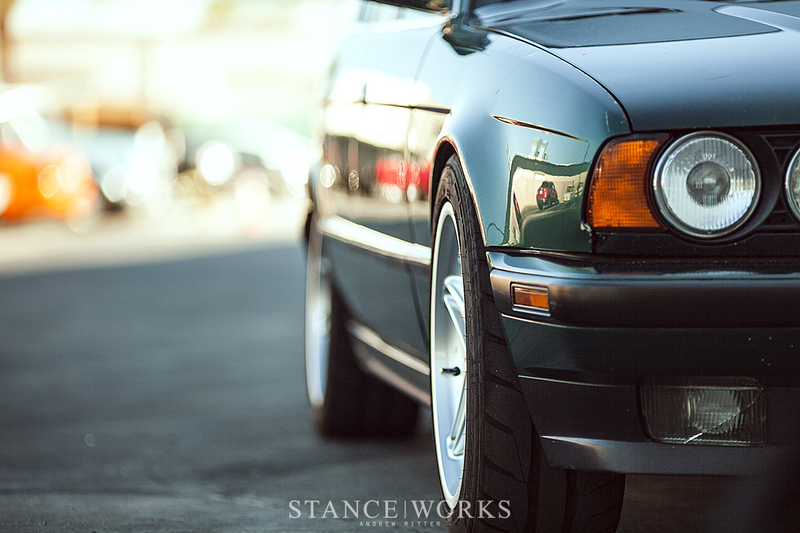 In Josh's case, the 17" Racing Dynamics wheels were made specifically for the E34 a few decades ago. These days, styles have changes, and we figured some spacers would help to push the wheel out towards the fender and aesthetically make for a nicer finished package. 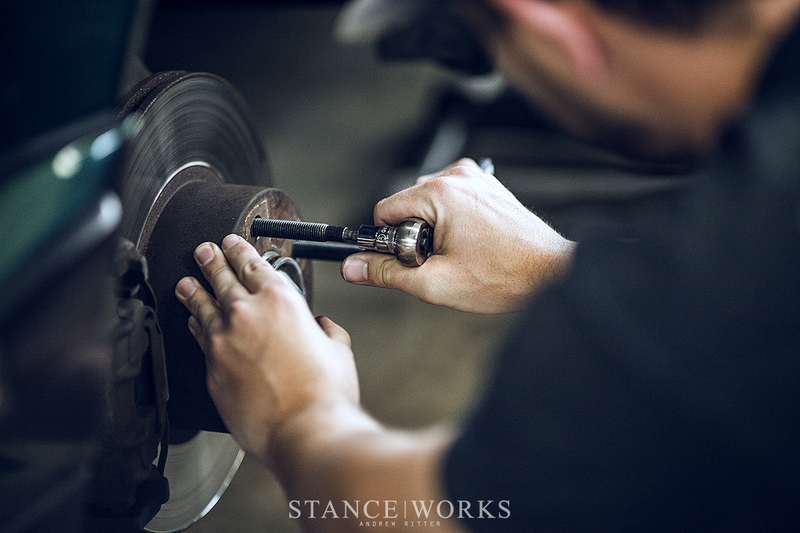 In short, spacers allow you to change a wheel's "offset," or "backspacing" - the distance the vehicle's hub surface is from the wheel's center or rear, respectively. 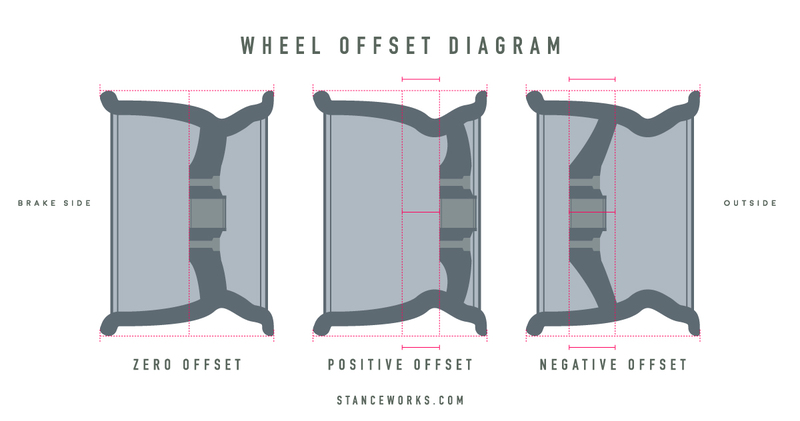 However, spacers only allow you to change the wheel's offset in the negative direction. In other cases, sometimes we need room on the inside of the wheel. Perhaps our new wheel or tire setup doesn't quite clear the inner fender, brake calipers, or the suspension bits and pieces - wheel spacers can help move the wheel outwards and away, giving the necessary clearance to drive. Lastly, there's the benefit of increased track width. With the wheels and tires pushed outwards, it can offer improved handling characteristics, meaning wheel spacers help in both aesthetics and performance. 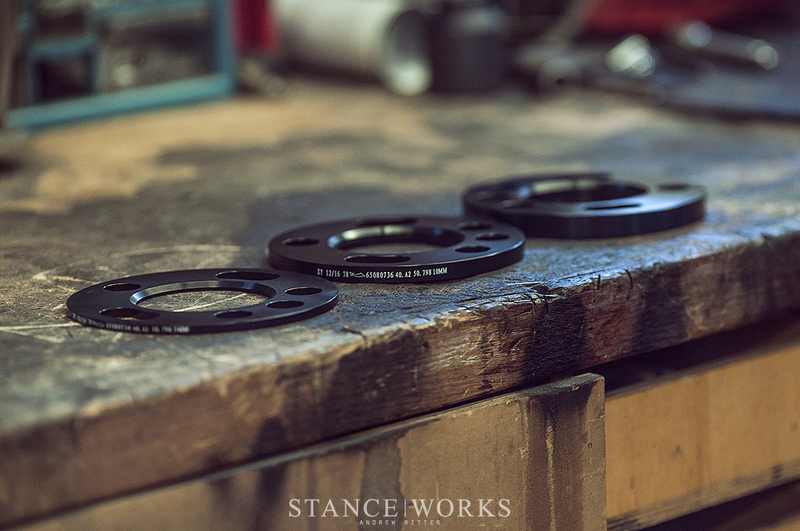 So, we hope you're still with us, and understand why you might want spacers. Now it's important to select the right spacers for your car. While almost all cars mount wheels in the same way, most cars differ in small ways, so it's important to make sure you buy a spacer that works with your specific car. There's three measurements you should familiarized yourself with when purchasing spacers: PCD, Hub Bore, and Spacer Thickness. Up next is hub bore. The hub of the car is what ensures the wheel is centered, and is situated in the center of the car's PCD. Measuring it is simple - just measure the diameter. Wheels have hub center bore measurements too, often just fractions of a millimeter bigger than the hub bore of the car. 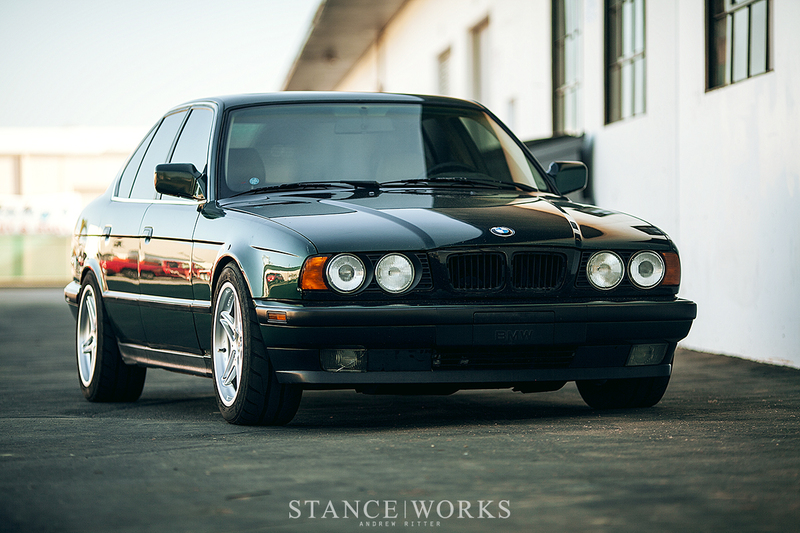 Josh's E34, for example, is 52.56mm - the standard for almost every BMW ever built. Both of these numbers may seem complex, but rest assured, it's pretty easy. 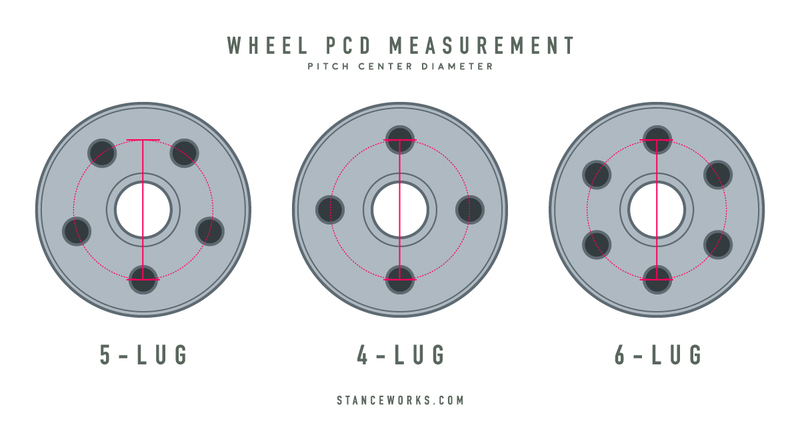 Most vehicle lineups share PCD/Bolt patterns and hub bore sizes. Using Josh's BMW as an example once again, every 5-lug BMW produced up to today uses a 5x120 bolt pattern, and a 52.56mm hub bore, save for a couple. A bit of googling is sure to help you find out exactly what is needed for your car. Once you have those numbers, you're just about ready to order wheel spacers. The last thing you need to decide is what thickness of wheel spacer you need. For this, you only need a ruler or tape measure. You'll want to see how far you can move the wheel and tire outwards before it interferes with the fender. Make sure to leave yourself a bit of wiggle room. If you're using spacers to clear internal components, simply measure how much room you need. It's important to approach this with care - buying spacers that are too big or too small could mean interference problems, which could cause tire rubbing or worse. 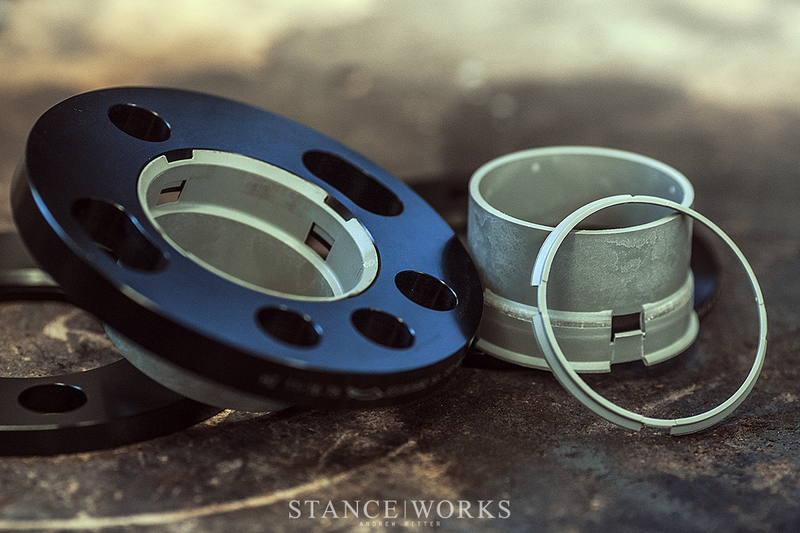 Spacers come in a multitude of sizes, which should allow you to fine-tune your car's fitment to perfection. ST Suspension's spacer lineup makes all of the above easy: their DZX spacer system allows for almost every PCD in one spacer, taking out most of the legwork on your end. One spacer suits all. They have made hub bores easy too, as simple plastic hub inserts are used to make the universal spacers work specifically with whatever your application. 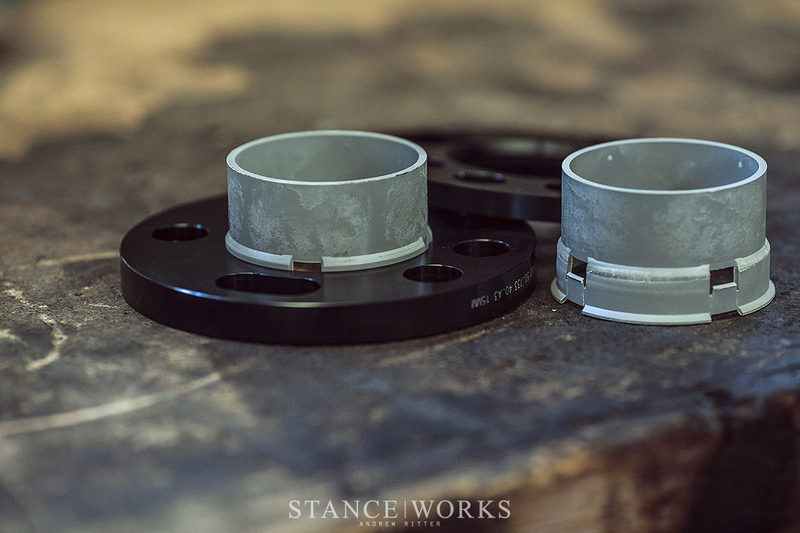 Ordering the correct hub inserts will ensure the spacers bolt up and work perfectly. The plastic inserts simply snap in and out of the back of each spacer, allowing you full control over the final fit. 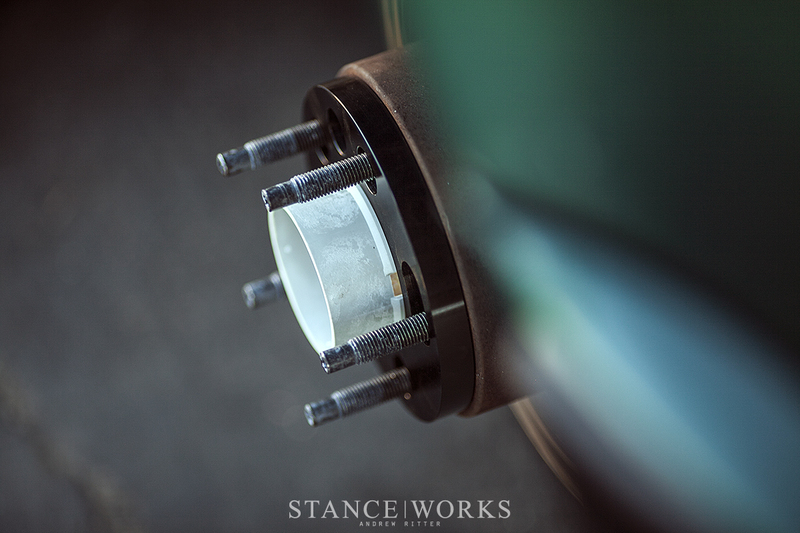 An added benefit is that with ST Suspension's removable and exchangeable hub inserts, swapping spacers between various cars and wheels becomes that much easier as well. With spacers available in sizes ranging from 5mm, up through 7.5, 10, 12.5, 15, 17.5, 20, 22.5, and up to 25mm, we're guessing you'll find everything you need to set your car up perfectly. When installing spacers, it's important to make sure your lug bolts or wheel studs are long enough for the job. The rule of thumb is that a lug bolt or nut needs at least 6 or 7 full turns on it to adequately support the load of the car. For Josh's car, we knew we'd need longer hardware, so we took the opportunity to convert the car to wheel studs instead of BMW's standard bolts. The advantages are often debated - but in our case, we'll be happy with the improved ease of installing wheels. We'll no longer have to dangle the wheel with one hand and insert lug bolts with another. 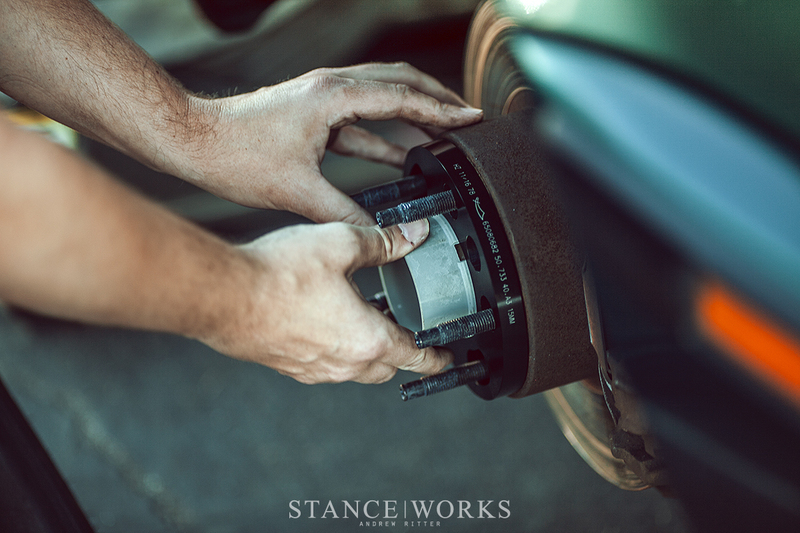 Installing the spacers is as easy as can be - simply remove the wheel, slide the spacer on, and reinstall. We finished Josh's car within a half hour, and as you can see, the result was worth the effort, transforming the car's stature immensely. And with that, the project is finished. We're happy with the outcome, and we hope you've learned a thing or two as well. Wow 5MM make’s a big difference! 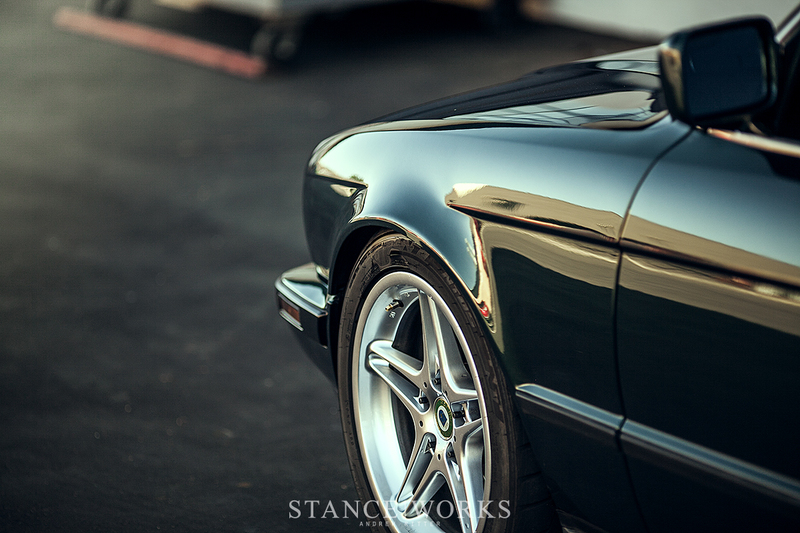 Does anyone know what specific mm spacer was used on this e34?